All night my angel wrestled with me. She told me to take what God wants me to own. Taking something for myself in this life, has been a real crisis. Why do I allow scum to walk over me and push me around. Why do I even mention their name. It has to do with the Founding of this Democracy, that put the Church in the hands of We the People. That Republican (evangelical) Senators of King Jesus are employing a woman prosecutor to question Ford, is such a slap in the face to women, who only earned the Right to Vote in 1920. The Protestant-Baptist- Catholic Church opposed this right – all the way! It is THE GREAT FLAW of our Founding Fathers. The Church in Democracy, was an EMPTY CHURCH. The Great Royal Families of Europe ALWAYS allowed their women to play a huge role in the Church. The Lombards are a good example. The minute that woman prosecutor utters who first word in OUR Senate, not only is everything that came from Martin Luther, DEAD. this Democracy – is DEAD! This is The Great Humiliation of the People of the United States of America, who are THE JUDGES! The Rrat Senators have set up a Protestant Inquisition, which is a breach of Separation of Church and State. My ancestor, Gottschalk Rosemond, defended the Great Erasmus from the Spanish Inquisition in Holland. Kavanaugh must submit to my questioning, and God’s Authority, in order to end this charade. Put him in a room with me – alone! Pope Francis would be wise to contact Kavanaugh and ask about his visits to the confessional, for if he is put on our Supreme Court. and real evidence is presented he gang raped a minor, the Catholic church will come under more scrutiny, for, failing to screen those who rise to the top. Above is my ancestor’s book about reforming the Confession. It appears a Habsburg Royal owned it. His Latin name is spelled – ROSEMONDO. Why was a Catholic chosen? No reporter is asking. I believe this is a secret way for the Pope to put a papal seal on the abortion issue. Are the women of this Democracy under attack by celibate men and the Papacy? We are on the eve of destruction! The Rrat Heresy is being – severed – cut off! Good riddance! A third woman has come forward to accuse Donald Trump’s Supreme Court pick, Brett Kavanaugh, of sexual misconduct, according to a statement published by her lawyer Michael Avenatti. Avenatti tweeted a declaration made in the name of Julie Swetnick, a resident of Washington, D.C., which said she had met Kavanaugh and his school friend Mark Judge in the early 1980s. On this day, August 10, 2018, I claim all castles and lands that the Rosenberg, Seinsheim, and Schwarzenberg family acquired as rulers of Bohemia and Czechoslovakia . Erkinger Seinsheim is my 14th. great grandfather, and, Peter von Rosenberg, my 15th. This is approximate, and needs more study. I was destined to save the land of my ancestors from Putin, the Ult-right, and Donald Trump who declared NATO an enemy of the United States. NATO was founded in order to save Czechoslovakia from the Soviet Union. There will be many posts on this Quest, that is a Dynastic as well as Political and National device to save NATO and all of Europe. Scroll down to see the property I might soon own. 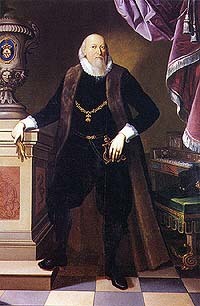 Peter Vok was born in Český Krumlov, the son of Jošt III of Rosenberg, then head of the house of Rožmberk, and his wife Anna of Rogendorf. Fourteen days after Peter’s birth, his father died. Peter came under the guardianship of first his uncle Petr V of Rožmberk and later Albrecht of Gutnštejn, Oldřich Holický of Šternberk and Jeroným Šlik. He received his early education at home in the castle at Český Krumlov. Even as he reached adulthood, Peter lived in the shadow of his older brother William. While William was a life-long Catholic, Peter sympathised with Utraquism and eventually joined the Unity of the Brethren. William died in 1592, and Peter inherited the Rosenberg holdings. From his childhood, Peter Wok grew up in the shadow of his older brother Wilhelm von Rosenberg who was being prepared for the position of Rosenberg. This was a reason why Peter Wok never achieved a more influential position or more success in politics and lived in seclusion at the Bechyně castle. He took over the care of the Rosenberg after Wilhelm´s death in 1592. Because he did not have any children with his wife Kateřina of Ludanice, he was forced to sell the Český Krumlov castle to Emperor Rudolf II von Habsburg in 1601, also because his family was in deep debt. Peter Wok used to be described in the older literature only as a spoiled profligate, but this is quite untrue. The “last Rosenberg” died in 1611 in his residence in Třeboň. See also the last Rosenberg, Peter Wok von Rosenberg. 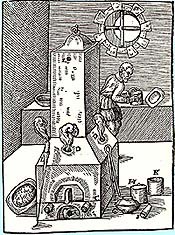 The second half of the 16th century is usually called “the golden age of alchemy”. Beside Emperor Rudolf II. von Habsburg, it was Wilhelm von Rosenberg who became the most important Maecenas of the hermetic sciences, especially of alchemy. Around the House of Rosenberg, in fact, arose a second center of hermetic and alchemic activity. Not only renowned and lesser known enthusiastic seekers, but also skilled con artists worked their magic in the Prague Rosenberg Palace as well as in different seats of Wilhelm’s South Bohemian dominion – in Třeboň, Prachatice, and especially in Český Krumlov, which used to be called “the South Bohemian Mecca of alchemists”. Erkinger I. von Seinsheim, Freiherr von Schwarzenberg (zunächst nur Erkinger VI. von Seinsheim ; * 1362 ; † 11. Dezember1437 in der Kartause Astheim ) war Oberjägermeister des Hochstifts Würzburg und Stifter .Erkinger I. von Seinsheim, Baron Schwarzenberg  (initially only Erkinger VI of Seinsheim , * 1362 , † December 11, 1437 in the Charterhouse Astheim ) was chief hunter master of the Hochstift Würzburg and donors . Ab 1416 trug er den Titel eines Kaiserlichen Rates . From 1416 he bore the title of Imperial Council . Er wurde 1429 in den Frei- und Bannerherrenstand erhoben. He was raised in 1429 in the free and banner lords. Erkinger gilt als Stammvater der späteren Fürsten zu Schwarzenberg . Erkinger is considered the progenitor of the later Prince of Schwarzenberg . Erkinger von Seinsheim wurde im Jahr 1362 als erster und einziger Sohn von Michael I. von Seinsheim geboren. Erkinger von Seinsheim was born in 1362 as the first and only son of Michael I. von Seinsheim. Seine Mutter war Margarethe von Rosenberg , mit der sich der Vater nach dem Tod der ersten Frau vermählt hatte. His mother was Margarethe von Rosenberg , with whom the father had married after the death of the first wife. Michael von Seinsheim war Burghauptmann der Festung Marienberg und als solcher dem Würzburger Fürstbischof unterstellt. Michael von Seinsheim was captain of the fortress Marienberg and as such subordinated to the Würzburg Prince Bishop. Erkinger wuchs auf der Burg Stephansberg nahe Haidt auf. Erkinger grew up on the Stephansberg Castle near Haidt . Nach dem Tod des Vaters am 30. Juli 1399 übernahm Erkinger die Besitzungen. After the death of the father on July 30, 1399 Erkinger took over the possessions. Die Familie war wohlhabend und der junge Adelige konnte durch Zukauf die Familiengüter vermehren. The family was well-to-do and the young nobleman was able to multiply the family goods by buying them. Noch im Jahr 1399 kaufte er das Dorf Astheim , 1406 wurde er Oberjägermeister des Hochstifts Würzburg . Still in the year 1399 he bought the village Astheim , 1406 he became Oberjägermeister of the high pin Würzburg . Am 2. Juni 1409 übergab der Herr von Seinsheim das Dorf Astheim an den Kartäuserorden, der hier ein Kloster gegründet hatte. On June 2, 1409, the Lord of Seinsheim handed over the village of Astheim to the Carthusian Order, who had founded a monastery there. Die Kartause Pons Mariae (lat. Marienbrück) wurde Grablege für die Familie. The Charterhouse Pons Mariae (Latin Marienbrück) was burial place for the family. Die Nähe zu König Sigismund von Luxemburg führte im Jahr 1416 zur Ernennung zum Kaiserlichen Rat. The proximity to King Sigismund of Luxembourg led in 1416 to the appointment to the Imperial Council. Ein Jahr zuvor, 1415, wurde auf kaiserlichen Befehl das Dorf Scheinfeld zur Stadt erhoben. A year earlier, in 1415, the village Scheinfeld was raised to imperial power to the city. Es muss sich zu diesem Zeitpunkt bereits in der Hand des Erkinger befunden haben. It must already have been in the hands of the Erkinger at this time. Der Adelige hatte Schloss Schwarzenberg nahe Scheinfeld von den Herren von Vestenberg, von Abenberg und dem verschuldeten Hochstift Würzburg erworben. The nobleman had acquired Schwarzenberg Castle near Scheinfeld from the Lords of Vestenberg, Abenberg and the indebted Hochstift Würzburg. In den Jahren 1420 und 1429 wurde Erkinger Feldhauptmann des Königs und zog gegen die Hussiten ins Feld. In the years 1420 and 1429 Erkinger became captain of the king and moved against the Hussites in the field. Die Krönung seiner Karriere erreichte Erkinger im Jahr 1429. Er wurde vom König zum Frei- und Bannerherren ernannt und damit Teil des Herrenstandes. The coronation of his career reached Erkinger in 1429. He was appointed by the king to the Free and Bannerherren and thus part of the manor. Zugleich war Erkinger allerdings immer noch Ministeriale des Würzburger Fürstbischofs Johann II. von Brunn . At the same time Erkinger was still ministerial of the Würzburg Prince-Bishop John II of Brunn . Von diesem kaufte er sich im Jahr 1432 ein Gut auf dem Marienberg oberhalb Würzburgs. From this he bought in 1432 a good on the Marienberg above Würzburg. Erkinger heiratete zweimal. Erkinger married twice. Zunächst ehelichte er Anna von Bibra , die allerdings bereits am 4. März 1418 starb. First, he married Anna von Bibra , which, however, already died on March 4, 1418. Sie wurde als erste in der Kartause bestattet. She was buried first in the Charterhouse. Mit ihr hatte er sechs Kinder, darunter den Nachfolger Michael II. With her he had six children, including the successor Michael II. Nach dem Tod seiner Frau heiratete Erkinger erneut, diesmal Barbara von Abensberg . After the death of his wife Erkinger married again, this time Barbara von Abensberg . Mit ihr zeugte er wiederum acht Kinder. With her he begat eight children again. Sie verstarb am 2. November 1448 und wurde neben ihrem Mann in Astheim beigesetzt. She died on 2 November 1448 and was buried next to her husband in Astheim.